Mostly traditional, local and English varieties of apple, pear, and other fruits, available on dwarf to full-size rootstocks, grown on the Somerset and Devon border near Wellington and available by mail order, gift vouchers and at farmers markets around the South-West including Frome, Glastonbury, Crediton, Axbridge and Wiveliscombe. Pre-innoculated with mycorrhizal fungi. Trees can be bought by post through our website, directly from us at markets, or picked up (see below). From orchards to back gardens, we are happy to give advice on varieties and rootstocks. Fruit trees can also be bought direct from us at a number of Farmer's markets in the South West. Pre-orders welcome. To order for pick up or collection, please type COLLECT at checkout in the Promotion code box. Although we are not a public nursery, you can pre-arrange to pick-up trees from us in Devon, or pre-order to pick up at a farmer's market. To order for pick up or collection, please type COLLECT at checkout in the Promotion code box. 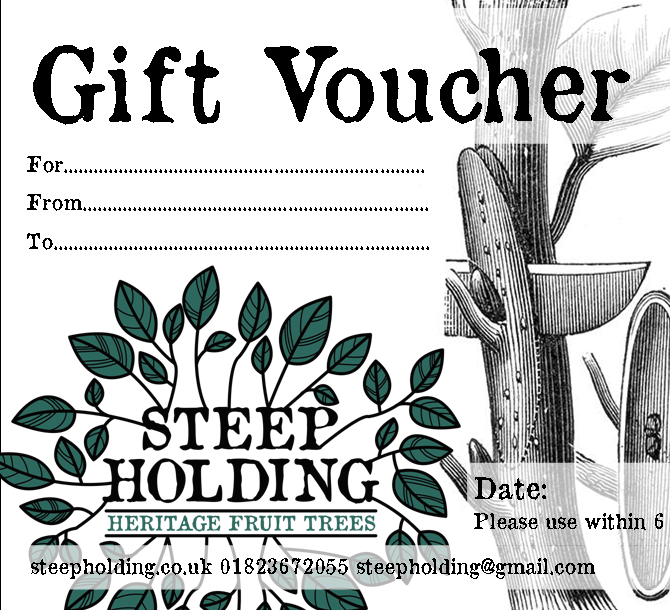 Fruit trees make fantastic presents and we now offer gift vouchers, which enables the recipient to decide which trees they would like for themselves. We graft many of the best old fruit varieties, including over thirty varieties of apple onto dwarf to full-size rootstocks. The trees are mostly available bare-root from December to March, but a good selection of potted trees are also available throughout the year. We graft all our trees onto certified virus free rootstock and regularly check for disease as they grow. Unlike most conventional fruit trees, our trees never see any chemicals, being hand-weeded throughout their lives. To give your fruit tree a really healthy head start we can also send them with their roots wrapped in compost and pre-innoculated with Mychorrizal fungi, giving it a huge 'secondary' root system within weeks, which will feed and support it. This option also gives you more time after the trees arrival before needing to plant it in the ground, as the tree will usually be happy for a few weeks in its bag of compost. Please order 'root wrap & innoculation' once for each tree that you order to cover our costs for compost, innoculant and postage.